Jacob of Kefar Sama (Sakonya), a Judæo-Christian, wanted to charm away the deadly effects of the bite by formulas in the name of Jesus; but Ishmael did not believe in such charms and would not allow him to come in. Just as Ben Dama essayed to prove to his uncle that there could be no objection to the cure from a Jewish standpoint, he died, and Ishmael exclaimed, "God has shown thee mercy in that thou didst depart in peace and didst not transgress the law of the sages" (Tosef., Ḥul. ii. 22, 23; 'Ab. Zarah 27b; Yer. 'Ab. Zarah ii. 40d). 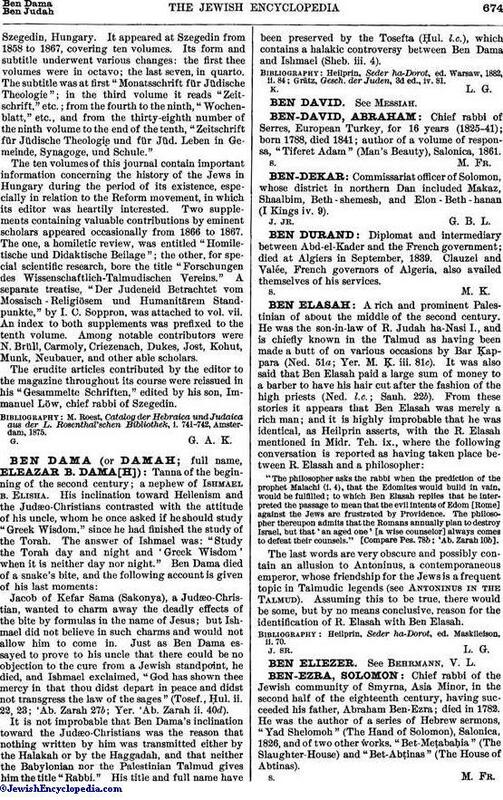 It is not improbable that Ben Dama's inclination toward the Judæo-Christians was the reason that nothing written by him was transmitted either by the Halakah or by the Haggadah, and that neither the Babylonian nor the Palestinian Talmud gives him the title "Rabbi." His title and full name have been preserved by the Tosefta (Ḥul. l.c. ), which contains a halakic controversy between Ben Dama and Ishmael (Sheb. iii. 4). Grätz, Gesch. der Juden, 3d ed., iv. 81.